Shopping for Dinosaurs Construction Toys? Tyrannosaurus rex was a bipedal carnivore with a massive skull balanced by a long heavy tail. Relative to its large and powerful hind limbs, the fore limbs were short but unusually powerful and had two clawed digits. The most complete specimen measures 40-feet long x 12-feet tall and weighs over 11 tons. But using the smallest building blocks in the world, you can build your own Tyrannosaurus that fits in the palm of your hand! These building blocks enable you to execute even the finest details like never before. 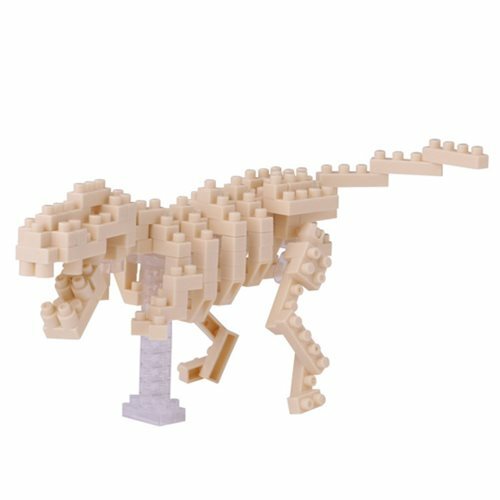 The T-Rex Nanoblock Constructible Figure is challenging fun for all the construction enthusiasts in the family! Ages 12 and up.